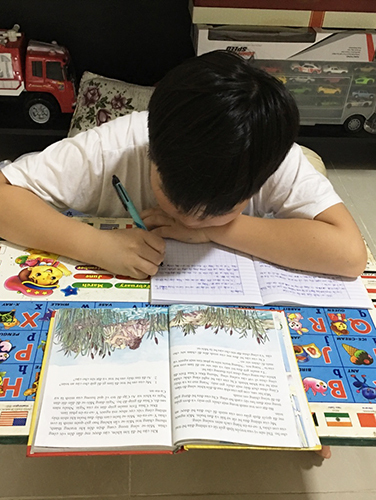 Danny, a young Vietnamese boy, copies the story of Moses from his Bible storybook into his notebook. Right now, LHF has several books available in Vietnam, including A Child’s Garden of Bible Stories and Reading the Bible with Understanding. A new edition of Luther’s Small Catechism is underway, and so is the Book of Concord. In Vietnam, LHF’s books help people a lot with their spiritual life, especially children because they are being taught God’s Word ever since they are young. The stories in A Child’s Garden of Bible Stories are very interesting and practical to those who read them. People understand more clearly than they did before, and so their faith in Jesus Christ of course grows stronger. Children and their parents really appreciate the book since it is colorful, meaningful and useful to them. A very strong point is this storybook is well-organized and designed – much better quality compared with other Christian books in Vietnam right now. Something new that we are doing is to make recordings of all of the stories and put them on our website for people who do not have time to read the book, and they are able to listen to the stories with their kids at bedtime. For sure, this book is free but very priceless!